Giving Tuesday is the global day of giving that falls after Black Friday. Join the movement dedicated to giving back by supporting the Vancouver International Children’s Festival Society! On November 30th during the Vancouver Christmas Tree Lighting at Robson Square, four magnificent holiday trees, one of which is 76 feet tall, will come alive with hope and light. Help us light the trees which will be lit until the first week of January. Buy a Bulb to support one of our many Outreach Programs! 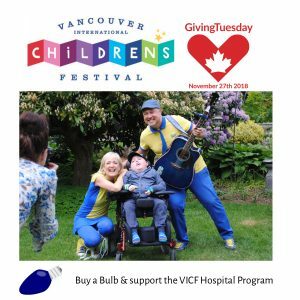 Buy a Bulb and help us bring the Festival to children in treatment or care at B.C. Children’s Hospital, Canuck Place and Sunny Hill Health Centre through our Hospital Outreach program. Children unable to leave their facilities can share in the Festival spirit with their families and benefit from the healing power of music and laughter. Buy 1 bulb for $5, 15 bulbs for $10 or 30 for $20. 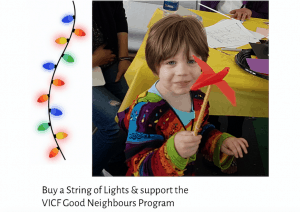 Buy a String of Lights for $60 and bring a deserving family to this year’s Children’s Festival! For too many families, a day at the Festival is just not possible. Become a ‘Good Neighbour’ and share the magic of the Festival with children and parents who otherwise would not be able to attend! 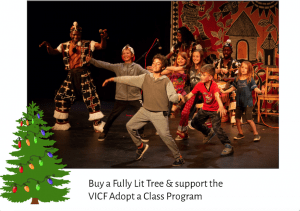 Buy a Fully Lit Tree for $1,200 and bring a vulnerable school group to the Festival! This program provides performance tickets, bus transportation and all-day access to our arts activities for school groups across Metro Vancouver that would otherwise be unable to attend the Festival. Help us reach even more kids and families this year than ever before. Please make your donation today! 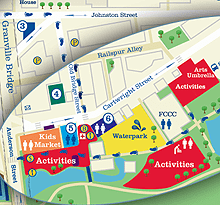 Vancouver International Children’s Festival Society is a registered charity and can issue charitable tax receipts for donations over $20.00. There is no sound in the world more precious than the carefree laughter of children. Nothing as heart-warming as the smiles of delight on the faces of children, who for even one hour, can forget about their illness, physical challenge or financial constraints, are a testament to the value of our programs. Laughter often really is the best medicine. Oh my goodness! I was literally tearing up watching the interactions with the kids and the entertainers. So many gasps and smiles and hugs….so many hugs!!!! Was certainly one of my favorite days at work in a really long time. Thank you for continuing to support these incredibly special programs for the children and families of Canuck Place.